The Xiaomi Mi 9 is a fantastic all-round device, offering many of the bells and whistles of high-end phones but without the price tag. Update: Vodafone in the UK has confirmed it will be carrying the Xiaomi Mi 9 in that region, settling doubts we had that the Mi 9 would make it at all. In its 'Coming Soon' rundown it lists the phone, as well as other devices like the Samsung Galaxy A70 and the Huawei P30 Lite. These other handsets are also affordable but powerful smartphones, and they likely pose some competition to the Xiaomi Mi 9, so Xiaomi will have to choose a smart final price in the UK when the phone launches. Xiaomi has confirmed to TechRadar that the company has no plans to bring the Xiaomi Mi 9 to the US however, which is understandable given the company hasn't entered the US market yet, although the Mi 9 wouldn't have been a bad place to start. Xiaomi is still fairly new to the mobile market outside of China – the Xiaomi Mi 8 Pro was the first phone launched in the UK for example, in 2018 – but it’s posing some serious competition to establish brands with the Xiaomi Mi 9, its newest flagship device. The Mi 9 looks like a fantastic jack-of-all-trades device; it has a powerful processor, impressive camera setup, and supports up to 20W fast charging – and on top of that it’s a whole load cheaper than phones with a similar spec. It’s not without drawbacks – Xiaomi has clearly had to cut some corners to get a fantastic chipset and camera array into the handset at such a low price, and its attempt at designing its own UI for the Mi 9 likely won’t please everyone. Since release competitors to the Xiaomi Mi 9 have come out, most notably the Huawei P30, a three-camera photography powerhouse with a sleek design and impressive chipset, and it sits at a price-point only slightly higher than the Mi 9. But generally the Mi 9 is an impressive mid-range device, with internals that are surprisingly good for its relatively low price – so are this phone, and the Xiaomi brand in general, a serious threat to established mid-range Android players like Huawei and OnePlus?. The Xiaomi Mi 9 is available now in China, Spain and Italy, but its release date everywhere else is still a mystery. However, on April 18, Vodafone UK confirmed it will be stocking the handset "soon", alongside a host of other devices. 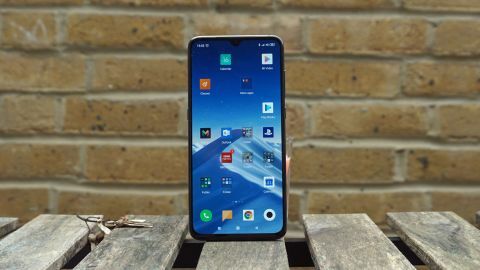 However Xiaomi has told TechRadar that for the time being, there are no plans to release the Xiaomi Mi 9 in the US, so if you're based there you might want to check out the 'Competition' section of this review for suggestions of other similar handsets instead of the Mi 9. We also haven’t received any official confirmation on the prices for the Xiaomi Mi 9 when it releases worldwide, but we can use the prices in euros to make a guess. The 64GB memory version of the handset costs €449 (roughly £390, ₹35,000, AED$1,849) while the bigger 128GB storage phone costs more at €499 (about £430, ₹38,800, AED2,000). While these prices may not convert exactly when the phone releases elsewhere it’s still a good indication of the price of the phone – and it looks like it fits comfortably in the middle of the price spectrum. The Xiaomi Mi 9 has a slightly curved glass back, giving it a distinct look and a comfortable feel. Xiaomi says this creates an appealing holographic effect; we didn’t notice this with the Piano Black handset we tested, but it’s possible the Ocean Blue or Lavender Violet colors create this effect a little better. The Mi 9 has a 6.39-inch AMOLED display, with a 2340 x 1080 Full HD+ resolution, which delivers vibrant colors with a great brightness range – it was a treat to watch movies on and complemented the fantastic camera array. This screen is broken by a small top bezel housing the front-facing camera, but other than that is unbroken, with no top bezel to speak of and minimal chin. The Xiaomi Mi 9 measures 157.5 x 74.67 x 7.61mm, so it’s a medium-sized device, but at 173g it does feel a touch on the heavy side – it’s no Moto G7 Power for sure, but we did start to notice its weight after long gaming sessions or photo shoots. On the bottom of the device you’ll find a USB-C port – though no 3.5mm headphone jack – while the volume rocker and power button are on the right side, and there’s a Google assistant button to the left. These buttons are pretty pronounced – we often accidentally pressed the Google assistant button when we put the phone down on its side or picked it up, which became annoying after a while. Generally, however, it’s a nice device to hold – the side buttons and in-screen fingerprint sensor are low enough to be easy to reach, the curved glass back feels comfortable in the hand for long periods, and the Google assistant button is out the way most of the time – although the large display does mean the top of the device can be hard to reach. Included in the box is a plastic case which fits the handset snugly, and conveniently hides how hot the phone can get – more on that later. While this feels useful for protecting the device it does add some extra bulk, so it may not be for everyone.